Marramiero is one of the better known wineries of the Abruzzo, and a friend insisted I try their wines a number of years ago. They greatly impressed me, but Vinitaly is large enough and dispersed enough that it's impossible to keep track of everyone. However, this year a tasting of sparkling wines in the Abruzzo pavilion was delayed, so I decided to take advantage of the Regione Abruzzo's stand to taste through Pecorino, a white grape that I knew little about. Though there are a number of theories regarding the name, which is clearly related to sheep (pecore in Italian, while Pecorino is also sheep's milk cheese), the most likely seems to be that the name is related to the transumanza, or twice-yearly migration from summer to winter pasturelands: Pecorino grapes ripen in early September, about the time of the migration south, and sheep, who know a good thing when they come across it, would eagerly enter the vineyards along their trails to eat the grapes. Hence the name. One of the Pecorinos that most impressed me at the Regione Abruzzo's stand was Marramiero's and I therefore took notes and then went to pay a visit to their stand. Pale brassy white with golden reflections and greenish highlights. The bouquet is fairly rich, with heather and greenish accents mingled with cut grass, hints of milkiness, and spice. Nice balance. On the palate it's ample, with fairly languid minerality supported by savory accents and sea salt, which flow into a clean savory finish uplifted by moderate acidity. Pleasant in a languid key, and will be nice as an aperitif or with simple soups and vegetarian dishes. As one might guess from the vintage, this fermented in steel. It's pale white, with greenish yellow reflections and highlights. The bouquet is still closed, though swishing brings up spice and cut heather, and floral accents with some greenish vegetal overtones. Nice depth. On the palate it's deft, with full savory yellow berry fruit supported by bright berry fruit acidity that flows into a fairly long savory finish. Quick to write but quite nice, and will work very well with vegetarian risotti, soups, or pasta dishes, and also has the power to accompany both fried fish and white meats. Worth seeking out. This instead goes into oak. It's fairly rich gold with greenish reflections and white rim, and has a powerful, fairly oaky bouquet with vanilla and butterscotch overshadowing fruit, though some acidity does emerge. On the palate it's ample and rather languid, with bitter savory minerality that flows into a clean mineral finish with some savory bitterness and hints of vanilla from the wood. It's quite elegant, and the oak will fold in nicely with time, but I missed the richness and vibrant acidity displayed by the unoaked Trebbiano. The former is a Siamese cat with all the brash talkativeness of the breed, whereas here it has had its claws pulled. If you like oaked white wines it is very well made, but you have to like the style. This is in steel; it's deep cherry ruby with cherry rim, and has a rich bouquet with cherry fruit supported by bitter India ink and clean leathery minerality. Pleasant and inviting, and there is also some acidity to provide lift. On the palate it's full and rich, with clean sweet cherry fruit supported by languid berry fruit acidity and smooth sweet tannins that display some warm splintery youth, but will become silky with time. Quite pleasant, and though it will drink very well with grilled meats, I'd also be tempted to swerve it with creamy dishes, for example a chicken pot pie. This is instead barrique aged; it's deep pigeon blood ruby with black reflections. the bouquet is intense, with India ink laced with cedar and some berry fruit, with underlying spice. It's still quite young, and coming together, in a more international key than the Incanto. On the palate it's ample and smooth, with rich berry fruit supported by smooth sweet tannins that have vanilla-laced bitterness more than acidity, and flow into a clean rather sour berry fruit finish with lasting bitterness. Pleasant in an international key, and if you like the style, which is powerful and fruit driven, you will enjoy it. Considerably, and it also has the capacity to age well for a decade or more. Brick almandine with black reflections and almandine rim. The bouquet is full and powerful, with jammy berry fruit laced with balsam and some acidity, and supported by wood smoke and cedar. Considerable harmony and depth coupled with great elegance. On the palate it's full and rich, with powerful slightly savory berry fruit supported by clean brambly acidity and smooth sweet tannins that flow into a clean fairly bright berry fruit finish with deft brambly acidic underpinning and some bitterness. Quite nice, and fully mature; it will continue to age nicely for many years, and will work well with grilled meats or hearty stews including those made from game. An impressive wine. Angelucci is a small winery that makes one wine, a Moscatello, using a Moscato clone indigenous to the Abruzzo, which was remarked on in the 1700s but then largely forgotten. The Angelucci family decided to revive cultivation, and had the grape recognized by the Regione Abruzzo's Department of Agriculture in 2009. Brassy gold with brassy reflections. The bouquet is rich, and classically Moscatello, with honeysuckle and honeydew melon mingled with sweetness and acacia honey. Quite intense and quite elegant. On the palate it's full and sweet, with rich candied apricot fruit with some honeydew melon accents, supported by bright acidity, while there are also bitter notes to balance the sweetness, and the finish is long and sweet. Quite pleasant; despite its richness it is light on its toes, and this makes it a refreshing change with respect to many Moscato-based Passiti that are more cloying. If you like sweet wines you will like it very much, and though people commonly talk about serving this sort of wine with dry pastries (shortbreads and similar) I would be tempted to serve it with cheeses instead. Donato Angiuli is a small winemaker located in Gioia del Colle that we missed in the course of our trip to Puglia this fall, because he doesn't like to present his wines at gatherings for the general public. Considering that many of these gatherings draw a great many people more interested in drinking than tasting, I can understand him. However, I'm quite happy that Enzo Scivetti introduced him to me at Vinitaly, because the wines were a revelation. Truth be told, Enzo took me to see him because of a white, rather than the reds that are the mainstay of production: Though the winery is located in Gioa Del Colle, they also have some vineyards in the Valle D'Itria, home to some of Puglia's finest white wines, and in addition to making a Verdeca, are reviving an almost forgotten grape called Maruggio, which they are producing in a sparkling version that is -- so far as I know -- unique. The wine is pale brassy yellow with fine perlage, and has an interesting bouquet with scents of apple juice and dried apples mingled with savory notes and sea salt. Particular, and brings to mind some of the Pecorino-based sparkling wines of the Abruzzo to mind. On the palate it's full and creamy with considerable minerality and savory accents that flow into a savory finish with, again, oxidized apple. It's very particular and a bit rustic, and is one of those wines that curious wine lovers will greatly enjoy, but that a casual wine drinker who is expecting a conventional sparkling wine will wonder at. Pale brassy white with brassy reflections. The bouquet is fairly intense, with citric accents and some aged cheesy notes - for want of a better descriptor -- mingled with sea salt and sage. Nice balance and harmony. On the palate it's full, with rather languid brambly white berry fruit supported by clean sour Regina Claudia plum acidity that flows into a clean fairly acidic mineral finish with greenish accents. Quite pleasant in a zesty key and will work well as an aperitif with rich antipasti and finger foods, or with succulent fish. Impenetrable pyrope with brick rim. The bouquet is intense, with chewy plum fruit and plum acidity supported by gum Arabic and balsam-laced spice. On the palate it's full, sweet, and quite soft, with moderately intense cherry plum fruit supported by warmth and smooth sweet tannins, with underlying moderate plum acidity. It's a touch drier than I expected from the nose, but displays considerable elegance, and is one of those wines I would drink by the glass far from the table rather than with foods. It's particular, and if you like the style, which is quite traditional, you will enjoy it very much, but you have to like the style. Per intenditori, for people familiar with Gioia del Colle's Primitivo. "Ottenuto dalla vinificazione in rosso d'uve nere elevate ad Alberello. Vino non Filtrato," it says on the label, which translates to "Wine obtained by the fermentation in red of black grapes from vines trained in the Alberello (i.e. bush) style. Unfiltered." The wine is from an 80-year old vineyard that yields about a thousand bottles per year. Impenetrable pyrope with black cherry rim. The bouquet is intense, with plum fruit supported by alcohol and greenish spice laced with hot iron and jammy sweet accents. I can almost hear Patricia Guy saying "the real deal." Impressive, and one could swish and sniff again and again. On the palate it's full and rich, with powerful sweet plum fruit supported by smooth sweet tannins and warmth more than acidity, which flows into a long, long plum prune finish that gradually fades into lasting warmth. Very pleasant, and despite its strength /17% alcohol) is very smooth and eminently drinkable. A most impressive discovery. Impenetrable pyrope with black cherry rim. The bouquet is rich, with plum fruit laced with blueberry jam and some alcohol, and also greenish accents, and menthol, mingled with sweetness and as it opens rich prune jam. Great depth. On the palate it's rich and quite sweet, with plum cherry fruit supported by sweetness and smooth sweet tannins underlain by some warmth. Quite elegant and ahs a lot to say. If you like this sort of naturally sweet red wine -- the sugar content is high enough that fermentation stops before the yeasts can consume them all -- you will enjoy it very much. And if you think you don't like sweet red wines you should try it, because it has a great deal to say. Where to drink it? Either far from the table, or with dark chocolate, or with cheeses, especially moderately intense herbal cheeses. Emilia Romagna boasts many important grape varietals, including the family of Lambruschi, and Sangiovese. The region also boasts many lesser varietals, and one of the more interesting (for me) is Fortana, a red varietal that has been grown in the sandy coastal zones of the Provinces of Ferrara and Ravenna for centuries -- some say since the XI century, while others say it was introduced by Renèe of France when she married Alfonso D'Este in 1500, and indeed it is also called Uva D'Oro, after Burgundy's Còte D'Or. And it may at some point have resembled Burgundy's varietals, though the effort needed to adapt to its new surroundings has had a profound impact upon it. Because the Bosco Eliceo is one of the more extreme Italian terrioirs, sandy coastal areas with saline breezes, thick mists, and brackish groundwater that feeds the vines. The soils are also extremely poor, and -- another unique aspect -- inhospitable to the phylloxera bug, so the vines are on native stock rather than grafts. 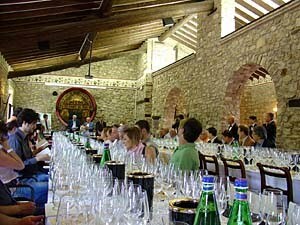 The Bosco Eliceo Appellation allows the use of a number of varietals, including Fortana and Merlot for reds, and Trebbiano and Sauvignon for whites, but I chose to concentrate on Fortana since it is unique to the appellation. Wines labeled Bosco Eliceo Fortana DOC must be at least 85% Fortana (15% complementary varietals are allowed), and be at least 10.5% alcohol (more on this below). In terms of yields, the DOC allows a maximum of 150 Quintals per hectare, though I doubt many wineries approach that. This combination of low alcohol content and brisk acidity makes Fortana a perfect summer wine, to be enjoyed at cookouts, or with fried meats and fish, and also with cold cuts and other cool dishes, for example Vitello tonnato, or even rich vegetable frittatas. In the winter months it will instead be perfect with Ferrara's Salama da Sugo, a rich well-seasoned salami that is simmered for hours, and then served with mashed potatoes. The combination is delightful! This is an IGT because it's from a vineyard planted on alluvial river sands (rather than marine sands) just west of the Bosco Eliceo Appellation. It's pale brick ruby with white rim, and has a muted bouquet (it was just bottled) that reveals, with swishing, minerality, spice, and cedar from grapes. On the palate it's ample and quite smooth, with fairly rich berry fruit supported by brisk acidity and smooth sweet tannins that are less dry than those of some of the other Fortane, and flow into a clean savory finish with tart mineral acidity and slight sandalwood accents. By comparison with the other wines it is more polished; it's pleasant and quite approachable, though in a tart key, and will be a good introduction to Fortana for those new to it. It will work quite well with lesser grilled meats or hearty pasta dishes, and will go quickly. 11%. This is 9% alcohol, which means there is still a fair amount of sugar. It's pale violet ruby with fine perlage that foams and settles.The bouquet is fairly rich, with jammy berry fruit supported by savory spice and a certain airiness and lemony acidity. Zesty. On the palate it's full and sweet, with rich cherry fruit supported by dusky tannins and sweetness, and by lively lemony acidity that flows into a clean bright finish, while the sparkle confers fullness and a creamy aspect. Nice, and will drink quite well at poolside or with simple cakes or cookies, or a crostata with fresh fruit. Bottom Line: Fortana is an interesting, and extremely approachable wine will be quite nice in the summer months, or with rich winter dishes along the lines of Salama or Zampone. It will age well for at least a year following the harvest, and perhaps two, though i don't think I would keep it for longer, because its freshness is one of its strong points. One comes across wineries in many ways. I was much impressed by the Azienda Agricola Costadoro's Bardolino Chiaretto Spumante at the Bardolino presentation this winter, and when I had to go to Bardolino for a weekend this spring discovered they have an Agriturismo and stayed there. It's quite nice -- towards the top of the hill overlooking Bardolino, with a beautiful view of Lake Garda -- and there's a pool too, though it wasn't warm enough when I was there to make swimming attractive. Costadoro is very much a family business, with Valentino Lonardi handling the winemaking, while his wife oversees the Agriturismo. And, to round out the picture, their relatives run the Ristorante Costadoro, which we much enjoyed. Bottom line: If you visit Lake Garda, the Agriturismo Costadoro is an excellent place to stay, and you will likely find yourself rearranging your bags before you depart to make room for some wine. Finding Costadoro beyond Bardolino will be a bit more difficult, though the winery is listed on Snooth. It is well worth looking for. Lively straw yellow with brilliant highlights and white rim. The bouquet is fresh and vinous, with lively slightly brambly heather and dried hay supported by lively mineral acidity. Refreshing in a direct, up front key, On the palate it's bright, with lively lemony fruit supported by some bitter mineral acidity that flows into a fairly long bitter mineral finish that gains depth from savory overtones. Pleasant, and an ideal summer wine that will work very well with quickly cooked fish or white meats, fried fish or meats, and also with pasta salads or summer pasta dishes, for example spaghetti al pesto. In short, versatile, and it will go quickly. Brassy yellow with brilliant brassy reflections and white rim. The bouquet is fresh, and frairl rich, with honeysuckle and tangerine mingled with underlying clover honey; it's fairly opulent. On the palate it's ample, in a rather languid key, with honey-laced white berry fruit supported by citric acidity and slight peppery notes that provide a counterpoint to the richness of the fruit and help keep it in line, flowing into a clean rather languid finish. Pleasant in a softer key than the Garganega, and will work better with more delicate dishes, along the lines of steamed fish, and I might also be tempted to serve it with delicate vegetable based egg dishes, for example a zucchini frittata. Given its languidity it will also be nice with mildly spiced Oriental dishes for example those from Canton. Pale salmon with brilliant electric pink-salmon reflections. The bouquet is rich, with lively sour strawberry fruit supported by some heather and pleasant berry fruit acidity. Quite refreshing, and invites another sniff. On the palate it's full, with fairly rich cherry strawberry fruit supported by moderately intense slightly brambly sour cherry acidity, and by light dusky tannins that have a very slight burr, and flow into a clean rather bright sour berry fruit finish with heather more than bramble overtones. Quite nice and will be a perfect cookout or picnic wine, and will also work well indoors with pasta salads, and other simple dishes along those lines. Or burgers; there's also a degree of languidity to it -- the acidity isn't exaggerated -- and because of this I would think to serve it with more spiced oriental dishes, say Hunaan Chinese or Thai, because there aren't the strong tannins of a red to clash with the spices. Worth seeking out -- it has improved since I tested it this winter -- and expect it to go quickly. Pale salmon with salmon reflections and brilliant salmon reflections and fine white perlage. The bouquet is muted, an effect of recent bottling, though swishing brings up floral accents and slight berry fruit. On the palate it's bright, with fairly rich savory berry fruit supported by clean bright acidity and spice; a fellow taster also finds mustard, which is there, and works very well, adding brightness and uplifting (as she says) the fruit . Quite pleasant, and when the nose has caught up with the palate (by June 2010) it will be perfect for a picnic or cookout, and also nice with summer foods enjoyed indoors. Worth seeking out. Elegant salmon with fine persistent perlage. The bouquet is fairly rich, with heather-laced sour cherry and raspberry fruit supported by some sweetness and berry fruit acidity. Nice balance. On the palate it's full and rich, with clean sour raspberry fruit supported by bright acidity, and by the sparkle, which brings considerable creaminess into the picture, and it all flows into a clean bright sour raspberry finish with underlying savory accents that emerge as the acidity fades. To be quite honest, the acidity is such that had I not read the label I would not have guessed it was a demi sec; it seems considerably drier, and will work very well with foods, ranging from creamy fish or vegetable-based risotti though grilled fish, and will also work nicely as an aperitif if you are so inclined. Impressive, and well worth seeking out. Novelli are intended to be drunk young, in the first few months following the harvest, so this is by now older than one would normally expect of a Novello, but Valentino gave me a bottle to see how it has held up. It's dusky cherry ruby with black reflections, and has a classic Novello nose,with ith the candied berry fruit that comes from carbonic maceration, supported by considerable sandalwood nutmeg spice that is, I think, something that has developed with time, because the dominant aspect of a young Novello nose is fruit, and with more swishing dusky bitter graphite accents also emerge. Quite alive, in any case. On the palate it's light, with fairly rich sour cherry fruit that has some floral accents -- it brings hyacinths to mind -- supported by sour berry fruit acidity and very smooth sweet tannins that flow into a clean rather sour berry fruit finish that gins depth from a sweetish underpinning and vegetal accents. It has held up very well, and though it is no longer what one expects of a Novello, will still drink nicely now at a cookout featuring simple white meats or burgers and such -- lightly chilled -- should you come across a bottle. I enjoyed it. Deep cherry ruby with black reflections and rim paling to white. The bouquet is bright, with rich brambly cherry fruit supported by some sandalwood notes and some berry fruit spice; there is also dusky bitterness and very slight sweetness. On the palate it's light, with moderate berry fruit supported by light smooth tannins and fairly rich mineral acidity that gains depth from peppery accents and flow into a clean cherry finish with some underlying acidity. The palate isn't quite as rich as I had hoped from the nose, and this is also an effect of the 2009 vintage, which was more difficult than some; this said, it's a pleasant and quite versatile quaffing wine that will work very well with simple grilled meats along the lines of burgers or chicken, and also with the other fixings of a cookout, including pasta salads or creamy things such as potato salad. Expect the bottle to go quickly, and you will want another. This is a vineyard selection, and has a pleasant hand-written label; in terms of aging it spends a year in steel. The wine is lively cherry ruby with brilliant ruby reflections and white rim. The bouquet is rich, and quite elegant, with berry fruit supported by fresh rich floral accents -- violets -- and hints of pomegranate; it's a distinct step up from the basic Bardolino, and while this is in part its being a vineyard selection, it's also the vintage, as 2008 was much better than 2009. On the palate it's ample, with rich cherry fruit supported by sour berry fruit acidity and by smooth tannins that do have some dusky bitter brambly accents that provide depth and vigor, and flow into a clean fresh dusky berry fruit finish that lasts considerably. Very pleasant, and will work quite well with grilled meats, light roasts, and I would also think about it in the context of roasted white meats with gravy -- turkey, for example -- that would be overcome by a richer, more tannic red. Worth seeking out. This is, the label says, barrique aged; it's lively ruby with black reflections and white rim. The bouquet is fairly rich, with berry fruit laced with vanilla and some dusky accents as well, and some underlying mineral acidity. Pleasant, because the fruit is there, but more brooding than the unoaked wines. On the palate it's medium bodied, ample and rich, with bright ripe cherry fruit supported by lively berry fruit acidity and by smooth sweet tannins that flow into a clean fairly long sour berry fruit finish. The palate is brighter and richer than one would expect from the nose, and I found myself rather enjoying it; it will work well with grilled meats or light roasts, including creamier things along the lines of chicken pot pie, and it also has the acidity necessary to stand up to fried meats. I confess to having been doubtful at seeing the word barriques on the label, but was pleasantly surprised, because they support without impinging. Nicely done, and deft. This is, like the Superiore, aged in barriques, and says so on the label (which is not hand-written). It's deep cherry ruby with black reflections and white rim. The bouquet is fairly intense, with berry fruit mingled with more pungent oak than is present in the Superiore, which to a degree overshadows the fruit, while there is also some peppery sandalwood spice. On the palate it's ample, with moderately intense sour berry fruit supported by sour cherry acidity and tannins that have warm savory accents and a slight vanilla underpinning, though, as is the case with the Superiore, the oak is less evident on the nose than the palate. This wine is by comparison with the Superiore more acidic and slightly less concentrated in terms of fruit, which is more towards the sour end of the cherry spectrum, while the finish has sour cherry acidity and some sandalwood and is fairly long. It's a bit more traditional in feel than the Superiore, especially on the palate, and also a bit more aggressive; it's very much a food wine and will be nice with grilled meats, including heartier fare such as a Porterhouse steak, but you have to like the style. If you like smoother softer wines along the lines of Merlot, you will prefer the Superiore to this. If a zesty Barbera is instead your preference, this is right up your alley. This is a passito made from selected white grapes that are allowed to riposare, or rest. As is the case with the unoaked Broi, the label is hand-written. It's pale brassy yellow with brilliant faintly greenish brassy reflections and white rim. The bouquet is rich, with heather and honeysuckle mingled with sweetness -- not honey, but rather very ripe peach with a few mint leaves -- and a pleasant spicy airiness. On the palate it's full and quite sweet, with ample yellow peach and apricot fruit supported by considerable sweetness at the outset, which gives way to lively sour apricot acidity with some buttery accents, and flows into a long apricot acidity finish with some underlying minerality and brambly warmth. It's unusual, with acidity that brings the initial sweetness to heel and keeps the wine from being cloying, and this invites one to sip again. If you enjoy sweet wines you will enjoy it, because it has something to say and also works well with acidity, which is much more interesting that sweetness by itself. The folks at Villa held their first vertical 16 years ago, and it was a thing among friends, to get an idea of how their wines aged. Well enough that they decided to hold another the next year, and with time the gathering of friends morphed into Villa in Verticale, which is an eagerly awaited and quite popular June event. This year Alessandro Bianchi decided to showcase Cuvette, the wine he introduced in 1986 to celebrate his daughter Roberta's marriage to Paolo Pizzol. At the time the wine was a Sec, in other words several steps up from Brut in the sweetness scale, and as such was groundbreaking for Franciacorta, where most of the wines being made were Brut or drier. But Alessandro wanted a wine that could be drunk during the meal, and since few Italians at the time drank sparkling wines at table, he decided to go with something richer and more approachable than a Brut. Cuvette is a cru, from grapes grown in a hollow on a hillside vineyard, and is primarily Chardonnay, with about 15% Pinot Nero, The wine is in part briefly barrel aged, and then spends 3-4 years on the lees prior to disgorgement. 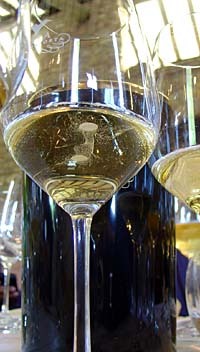 While its primary composition has remained constant over time, as Italians have become more comfortable with the idea of drinking sparkling wines with foods they have adjusted the liqueur d'expédition, gradually reducing the sugar content, so the wine passed from Sec to Extra Dry, and finally to Brut. As such, we were presented with a moving target as it were, with the 2005 though 2002 vintages Brut, the 2001-1999 vintages Extra Dry, and the 1997, 1994 and 1991 vintages Sec. All the bottles were production bottles, disgorged 3-4 years after going onto the lees, and as such offered an excellent opportunity to evaluate the longevity of Villa's wines. Which is impressive. Brassy golden yellow with greenish reflections and highlights. And fine perlage. The bouquet is elegant, with rich slightly greenish gunflint and spice with rich heather and hints of butterscotch and savory notes as well. Beautiful balance. On the palate it's rich, with powerful slightly greenish gunflint minerality supported by creamy sparkle and pleasant underlying savory bitterness and bitter acidity that flow into a clean bitter finish. Quite elegant, and very pleasant to sip; one could drink it as an aperitif, but it will also drink quite well with creamy dishes. Pale brassy gold with brassy reflections and greenish highlights, and fine intense perlage. The bouquet is intense, with heather and savory accents mingled with slight wet breadcrumbs, and some gunflint as well; as it opens it gains in intensity opens. Beautiful balance and tightly woven, very fine definition. On the palate it's full, rich, and creamy, with elegant minerality and some mineral acidity supported by creamy sparkle and rich mineral acidity, and also some butterscotch bitterness that flows into a long elegant finish with underlying savory notes that add depth and interest. Quite pleasant, and will drink very well with foods, though I might be more tempted to sip it away from the table. Pale brassy yellow with brassy reflections and slight greenish highlights, and fine persistent perlage. The bouquet is richer than that of the 04, and this is to be expected given the heat of the 03 summer, with more floral accents (honeysuckle, in particular) and less minerality, and also hints of butterscotch sweetness; there's also white berry fruit and some greenish accents. Nice balance is a slightly more voluptuous key. On the palate it's ample, smooth, and creamy, with rich butterscotch minerality supported by creamy sparkle, and flows into a clean bitter butterscotch laced finish with creamy underpinning from sparkle. It's softer than the 03, with less acidity, and this is again to be expected given the heat. A very fine expression of a difficult vintage, and will drink quite well as an aperitif. Pale brassy gold with brilliant brassy reflections and fine perlage. The bouquet is rich, with considerable savory minerality supported by some wet breadcrumbs, gunflint, and some greenish acidity; it's quick to write but extremely harmonious, and invites sniff after sniff. On the palate it's steely, with rich granitic gunflint-laced minerality that gains creaminess from sparkle and flows into a long mineral finish with some butterscotch and slight sour lemon; it's extremely fresh and bracing and has a long, exciting story to tell. Great regret when the glass is empty. Brassy gold with brilliant brassy reflections and fine intense perlage. The bouquet is rich, and slightly sweeter than the 2002, but then again it is an extra dry; there's greenish white berry fruit supported by some breadcrumbs and bitter accents with some greenish spice as well, with underlying lemony acidity. Pleasant in a richer key, and requires a mental shifting of gears. On the palate it's ample, with rich sour breadcrumbs laced with butterscotch and some gunflint bitterness and slight bramble, while there is also an underlying sweetness that confers roundness, and supports the sparkle, flowing into a clean rather voluptuous finish with underlying sweetness that's pronounced, but not cloying. Quite elegant, and will work very well as an aperitif, with cheese based antipasti or cheese dishes. Brassy gold with brassy reflections and fine perlage. The bouquet is rich, though not quite as rich as I had expected; with sweetness and minerality but not as much fruit, laced with savory butterscotch and slight bread crumbs; I found myself wondering if the extreme fry heat of August 2000 had an impact upon the ripening of the grapes. On the palate it's ample, and soft, and creamy, with butter apple and fruit supported by minerality more than acidity, and by creamy sparkle that flows into a clean rather bitter gunflint mineral finish. Pleasant, though a little more settled than the others, and this is due to the heat, which knocked back the acidity some. Quite nice, but it's more of a wine for a wine lover than for the general public; it's not as immediate as the 2001, but has more of a story to tell those who are willing to listen. Brassy gold with brilliant golden reflections and fine insistent perlage. The bouquet is fairly intense, with slight greenish mineral accents and savory spice, and clean greenish minerality as well. Impressive, with considerable depth, and though it's an extra dry it's not as sweet on the nose as some are. On the palate it's ample, and quite mineral, with some lemony accents and minerality supported by sparkle and mineral sweetness that flow into a clean savory mineral finish with slight bitter underpinning. Brassy gold with brilliant golden reflections and fine perlage. The bouquet is clearly mature, with savory mentholated accents underlying by a slight pungency that comes with age to some whites, and clean minerality; though it's a Sec it doesn't come across as sweet. By comparison with some of the younger wines it is less approachable, and takes more attention to plumb. On the palate it's ample and sweet, with rich butterscotch laced yellow fleshed fruit (apricot with hints dried peach) supported by sparkle and some savory minerality, and flows into a clean fairly sweet mineral finish with slightly pungent apricot-butterscotch overtones. It's a bit over the top, and this is a characteristic that's actually fairly common in 97 (which was hailed as the vintage of the century at the time) wines; it's very charged, with tremendous concentration, and takes things a little too far. Slightly paler brassy gold with greenish highlights and fine perlage it looks fresher than the 97. The bouquet is rich and fairly sweet, with fine floral fruit accents supported by sweetness and some sweet butterscotch, also some candied citrus and some warm milky accents as well. Graceful, and very nice to sniff. On the palate it's ample and sweet, with graceful white fruit that's not at all overripe, and is supported by bright lemony acidity and slight hints of butterscotch, while the sparkle also adds creaminess to the texture, and it all flows into a clean bright finish. The wine is less charged than the 1997, and much more graceful; it has a great deal to say and is, most impressive, one of those wines one enjoys, ignoring all else, and feels considerable sorrow to have finished. Brassy gold with brassy reflections and fine perlage. This is from a cooler, wetter vintage. The bouquet is fairly rich, with lemony fruit mingled with sour lemon, gunflint, and savory accents. Quick to write, but pleasant to sniff and one wouldn't guess it is entering adulthood at this point. On the palate it's ample, with rich savory minerality supported by lemony acidity that is quite intense, enough that the sweetness of its being sec really doesn't stand out, and supported by some bitter savory notes as well, and flows into a clean long savory finish with considerable lemony acidity and some gunflint bitterness. A very pleasant, and completely unexpected surprise; it doesn't seem like a sec thanks to its acidity, but has a pleasing fullness to the palate and will drink very well with foods, especially rich grilled fish. Having said this, the 94 is more about finesse, whereas this is a bit coarser and broader shouldered. It's not a wine most people would want to drink far from the table, but does have quite a bit to say and will work well with foods. I would expect it to age well for at least 5 years more. Tenuta Belvedere is a historic Tuscan estate located in the hills of Rosano overlooking the left (southern) bank of the Arno River, upstream from Florence in what would be the Chianti Colli Fiorentini Appellation. They have chosen, however, to bottle their red wine as and IGT because of limitations imposed by the rules governing the Appellation (among other things bottle size; they want, and the DOCG doesn't foresee, half-liter bottles). Though the decision to bottle is recent -- these are their first vintages -- they have always had vineyards; at present they have slightly under 2 hectares in production (1.5 ha red grapes, and 0.2 ha white grapes), all dating to 1970, and trained in the traditional archetto style. They are also retraining an additional 2 hectares of red vines to the Alberello style. Cultivation is strictly organic, and harvesting is manual, while the fermentation merits a few words. Langravio, their Sangiovese, is fermented in cement without temperature control (a practice also followed by Gianfranco Soldera, who says temperature spikes give nuances one cannot otherwise get), and then aged in tonneaux. Noesis, their white, is instead fermented in orce, terracotta urns, and also aged in them for 8 months. The medium does have an impact; I noted an intriguing minerality of a kind I hadn't encountered before in it and now I know why. Neither wine is filtered. Bottom line, this is a small estate, and just starting out, but they are doing interesting things and it will be very interesting to follow them as they gain experience and the new vineyard, planted to the Alberello style, enters into production and matures. This is a blend of Sangiovese, Canaiolo, Mammolo and Colorino, and is deep pigeon blood ruby with black reflections and cherry rim fading to pink. Imposing. The bouquet is powerful, with brooding cherry fruit supported by India ink bitterness and nutmeg spice, while there are also mentholated accents, and as it opens saddle leather and cut tobacco. Nice balance and considerable power. On the palate it's ample and quite smooth, with rich cherry fruit supported by deft slightly bitter acidity and by tannins that lay a smooth dusty trail across the tongue and flow into a clean bitter dusty finish. It's still quite young and needs time to finish coming together -- I would give it a year at least, and perhaps two. In terms of style, it is powerful, with considerable extraction and deft oak that has added quite a bit of polish to it while tempering the acidity as well; if you prefer lighter zestier expressions of Sangiovese you may not like it as much, but it is deft, like a well coordinated muscular athlete, and I much appreciated the fact that while the fruit is concentrated, it's not overripe. If you like the style, it will work very well with a porterhouse steak, cooked rare. The Fattoria Le Sorgenti is located upstream of Florence, on the Arno's left (southern) bank, and their vineyards are situated such that they are influenced by the river, which helps to mitigate extreme summer temperatures, while also helping to guarantee good day-night temperature excursions. Though they also produce Chianti Colli Fiorentini, they chose to send me their IGT wines, which also include French varietals; I found them quite impressive, and eminently approachable. They are wines of the sort one puts out at the table, and soon has to replace because they go well with foods, and one's guests have all emptied their glasses and are asking for more. This is, I think, a Good Thing. They have 16 hectares of vineyards, at altitudes ranging from 100 (Trebbiano and Chardonnay) though 450 (Sangiovese and Merlot) meters above sea level. Cultivation is strictly organic. This is a blend of Chardonnay and Sauvignon Blanc, and is brassy gold with golden reflections and white nail. The bouquet is powerful, and frankly oaky, with a great rush of savory butterscotch mingled with prominent gooseberry and some tropical fruit, and supported by savory accents and some savory mineral acidity. Nice balance in a very charged international key. On the palate it's ample, elegant, and more languid than I expected, with fairly rich minerality supported by moderate mineral acidity and by butterscotch laced bitterness that flows into a clean bitter mineral finish that's quite long. Pleasant, and will drink nicely as an aperitif with rich antipasti, or with flavorful, but not oily grilled fish, for example a sea bream. It will also be nice with soft, not too pungent cheeses such as Taleggio or Camembert, and dishes that include them as an ingredient, and I would be tempted to serve it with vegetable tarts, sformati, and similar, and igf you want to look further afield, sushi. Quite nice, and if you like the style, you will enjoy it; the oak is apparent but not predominant. This is a blend of Sangiovese, Merlot, and Alicante, a varietal closely related to Grenache that contributes to color and complexity. The wine is deep black cherry ruby with black reflections and cherry rim. Its bouquet is intense and fresh, with cherry fruit supportred by India ink -- almost quinine bitterness with graphite shavings as well, and as it opens spicy notes and cassis. Pleasant in a clean fruit driven key. On the palate it's medium bodied, with rich cassis fruit supported by spice and smooth sweet tannins that have a slight peppery burr, and flow into a clean fresh cassis finish that gains depth and direction from graphite shaving bitterness, and reveal some leafy underbrush as the fruit fades. It's pleasant and quite approachable, and will drink very well with simple grilled meats or light stews, and also has the capacity to age nicely for a few years. Though I might drink it now to enjoy its freshness. Expect the bottle to go quickly, and if you like wines of the international style it's worth seeking out. Deep pigeon blood ruby with purple-violet rim. The bouquet is fresh, with violets and cassis fruit supported by wet leather and spice, and by pleasant freshly ground back pepper. Zesty in a cheeky sort of way. On the palate it's medium bodied, with rich cherry fruit supported by dusky cedar laced tannins and moderate underbrush with some wet leather graphite bitterness that flows into a clean fresh cassis finish with underlying bitterness. It's not quite as rich as the 2006, and this is vintage variation; by comparison it's a bit more nervous and a bit more bramly, and while this will make it less pleasant to drink by the glass, the brambly accents of the tannins will work quite well with quickly grilled meats or light stews, and also be nice with more powerfully flavored meats, for example lamb chops. This is a Taglio Bordolese, a Cabernet Sauvignon - Merlot blend, and is almost impenetrable pyrope deep black reflections and cherry in the rim. The bouquet is powerful and dusky, with jammy berry fruit, cassis and cherry, supported bys savory underbrush and intriguing spice, which has hints of well salted grilled pepper to it, and also by hints of gum Arabic and cedar. Nice balance and considerable depth in an international key. On the palate it's rich, with powerful cherry cassis fruit supported by smooth sweet tannins and by moderate more mineral than fruit cidity, while the tannins are smooth and have a slight cedar backing, and flow into a clean fresh finish with bitter graphite shaving undertones. It's quite pleasant and quite approachable, and a fine expression of the 2005 vintage, which was cooler; the fruit isn't as intense as it might be in a better vintage, but they accepted this and worked with it rather than trying to bulk up the wine by other means (e.g. concentrators or new oak), and the result is rather graceful. A fine wine to open with a steak or a crown roast, which will bring much happiness to a special meal, and worth seeking out if you like wines of the more international style. Deep black cherry ruby with black reflections and cherry rim. The bouquet is powerful, and quite young, with cedar and grilled belle pepper mingled with cherry fruit and some vinous warmth, also dusky brooding aspects. It's pleasant but still coming together, and will profit from another year of bottle age at this stage. On the palate it's ample and rich, with powerful cherry cassis fruit supported by smooth sweet tannins and dusky dried leafy underbrush, and by deft tobacco laced mineral acidity, while the tannins are already smooth and silky, and flow into a clean rich cherry finish with slightly bitter tannic underpinning. Impressive, and very pleasant to drink; one could drink it already but would be mistaken to do so because when the nose catches up with the palate it will be fine indeed, in a rich fruit driven but not opulent nor overripe key, and will also age nicely for 5-8 years at least. It will be very nice with grilled meats or hearty roasts, and will also work well with game, for example stewed wild boar. Worth seeking out., but do give it the time it needs. For more information on the Fattoria Le Sorgenti, which also offers beautiful accomodations just a short distance from Florence, see their site, at http://www.fattoria-lesorgenti.com. Tenimenti Angelini has estates in Chianti Classico, Montepulciano and Montalcino. Valentina Paolini, who does PR work for them, asked me if I'd like to taste and compare the Sangiovese-based wines from the different estates at Vinitaly. I'm glad I said yes, because there are significant differences. We began with their latest Sangiovese-based wine, a Rosato made at the Tenuta Tre Rose in Montepulciano, which they introduced to meet the requests of people visiting the wine shop in their Montalcino estate. Lively charged pink with brilliant slightly salmon reflections. The bouquet is vinous and fresh with jammy raspberry accents and lively brambles as well. Zesty. On the palate it's pleasantly full, with bright raspberry cherry fruit supported by lively sour cherry acidity and by very soft brambly tannins that flow into a clean bright berry fruit finish. Quite pleasant and will drink very well at a cookout or with summer foods. A classic summer quaffing wine that will go quickly. The vini d'annata are aged in botte, whereas the selections and Riserve are aged in barriques. Pale brick ruby with black reflections and cherry rim. The bouquet is fairly rich, with dusky cherry fruit supported by moderate acidity and some brambles and slight smoky underbrush; it brings to mind dappled shade on a crisp fall day. On the palate it's medium bodied, with bright slightly sour cherry fruit supported by berry fruit acidity and warmth, and by tannins that have a slight greenish burr and flow into a fairly long berry fruit finish with tannic underpinning. Direct, and a classic food wine that will work well with pasta dishes, light roasts or stews, and is one of those wines that will support without taking center stage. Deep black almandine with back reflections and almandine rim. The bouquet is fairly intense, and cool weather, with dusky berry fruit supported by bitterness and some leaf tobacco, and also a fair amount of underbrush. Not as sunny as the 07 and this is to be expected. On the palate it's full and quite smooth with moderately intense berry fruit supported by cedar laced acidity and by smooth sweet tannins that flow into a fairly long cedar laced finish. A nice expression of cool vintage Chianti, and though ready will also age well for at least 5 years more. The fruit works well, and doesn't rely overmuch on oak, a common problem in the 2005 vintage. Dusky black cherry with black reflections and cherry rim. The bouquet is very different from those of the Chianti Classico,s with mentholated berry fruit supported by slightly balsamic acidity. It's a little more old school, and also has some intriguing greenish accents. On the palate it's bright, with zesty slightly greenish berry fruit supported by bright brambly acidity and by clean vegetal laced tannins that have a slightly raspy burr and flow into a warm fairly long sour cherry finish. Pleasant in a scrappy key and will drink quite well with grilled meats or light stews, and I would be quite happy to pour it at a cookout too. It also has the capacity to age nicely for 3-5 years, though I would be tempted to drink it now to enjoy its freshness. Deep black almandine ruby with black rim. The bouquet is intense, and smoky, with rich jammy cherry plum fruit supported by a fair amount of cedar; there's a languid feel to it that's almost but not quite slinky. On the palate it's ample and smooth with fairly rich cherry plum fruit supported by moderate acidity and by a fair amount of minerality, while the tannins are smooth and quite sweet, though they have a bitter pencil shaving foundation to them. Pleasant in a rich smooth key, and will drink well with drier meats. It's also young, and needs another year or two for the tannins to smooth completely and fold in. Very different in character from the rosso, which is much zestier -- this is softer. This is Sangiovese in purezza (the Nobile base has a little Cabernet), and is deep garnet ruby with black reflections and almandine rim. The bouquet is delicate, with slightly sour berry fruit supported by clean cedar and some spice. Pleasant to sniff and though ready clearly will go further. On the palate it's medium bodied and quite smooth, with full soft cherry plum fruit supported by clean sweet tannins that have a vanilla underpinning, and to be honest though the contribution of the oak is evident, I wouldn't have guessed it spent 2 years in new oak, because it has sufficient fruit to stand up to it. It will age nicely for 5-8 years more at least. Almandine with black reflections and almandine rim. The bouquet is muted at first swish, though further swishing brings up rather sour cherry fruit supported by heather and some savory accents, also pleasant intense spice from grapes, nutmeg and slight cloves in particular. On the palate it's full and quite smooth, with fairly rich cherry plum fruit supported by moderate acidity and smooth sweet tannins that have a languid feel to them and flow into a fairly warm dry finish. It's smoother and softer than I would have expected a Rosso to be, but is quite fresh, and I would drink it sooner rather than later to enjoy its freshness. This is made from the younger vineyards, which don't display quite as much depth as the older ones do, and it shows to a degree, because it's rather direct. And a bit of a seductive, curvy wine thanks to the softness and sweetness of the tannins. Slight peaches in the finish. Because of its softness it's a bit more particular in terms of pairings, and will work best I think with drier meats. Deep almandine with black reflections and almandine rim. The bouquet is fairly intense, with moderate berry fruit supported by dusky cedar with some balsamic accents as well. It's clearly a cool weather vintage, but seems to push harder than the 2005 Chianti Classico, and this is because of a difference in the grapes. The result is, when sniffing the two side by side, that the Chianti seems jammier, whereas the Brunello, which is also more almandine, is warmer and distinctly balsamic. On the palate it's ample and rich, with fairly intense sour cherry fruit supported by smooth sweet tannins that have some balsamic accents and slightly balsamic acidity that flow into a clean fresh rather savory balsamic finish. Pleasant, in a cool weather key, and will drink well with grilled meats or light stews. Deep almandine with black reflections and almandine rim. The bouquet is intense, and still very young, with considerable cedar that emerges at the outset, and as it opens reveals some berry fruit as well. A babe that is at the beginning of a long path. On the palate it's rich and smooth, and more along, with fairly rich languid cherry fruit supported by smooth sweet tannins that flow into a clean fresh berry fruit finish with some tannic underpinning with white pepper spice. It's graceful, but needs another couple of years overtones get its bearings and will age very well for a decade or more thereafter. This was the first vintage of Vigna Spuntali. Almandine with paler almandine rim. The bouquet is rich, and quite mature, with warm spice and balsamic accents mingled with sea salt and spice, and as it opens dried flowers and underlying red fruit -- more plum than cherry but red -- and pleasant savory accents as well. On the palate it's full and velvety, with rich slightly sour cherry fruit supported by dusky acidity, and by velvety tannins that flow into a clean bright rather lacy finish. Beautiful wine, and one that I would be tempted to drink with like-minded friends far from the table, because I would want to concentrate on it and not on the foods. Wanting to serve it with foods, a classic Bistecca alla Fiorentina would be nice. Allowing for vintage variations, this is the direction in which the 2004 Val di Suga is headed. If I were asked to describe the Sangiovese from the three regions with three words, I would likely select lively, soft, and austere. The Sangiovese from the Chianti Classico estate is has a bright, lively zestiness to I that makes it a perfect companion to a wide variety of foods; within this picture the Chianti Classico D'Annata is lighter and will work better with lighter dishes, ranging from hearty soups through red-sauced pasta dishes and quickly cooked meats, especially off the grill, The Riserva is, as one might expect, a little more substantial and will work well with heartier red meats or stewed white meats, but is cut from the same cloth. The Sangiovese from Montepulciano is a bit softer, and one has the impression that the summer is longer and hotter there than in Chianti Classico; the acidity is less marked and there is a sweeter softness to the tannins too, which are rounder and slightly more balsamic. Finally, the Sangiovese from Montalcino is more powerful and more austere: it displays a rocky solidity, coupled with considerable intensity; the glass of 2005 Chianti Classico Riserva seemed powerful when I first sipped it, but after sipping the 2005 Brunello it seemed considerably lighter and more ductile. In terms of accompaniments, the Brunello is clearly for important occasions; it will work best with hearty roasts such as leg of lamb or roast beef or tenderloin cooked rare, and will also work well with game, or hearty elegant stews. If you like the combination of aged firm cheeses such as Parmigiano or Bitto and dry red wines, will also work very well there. Or, if you like to hold a conversation with a wine far from the meal Brunello is a fine choice, because it will capture and hold your attention. In short, three different expressions of the same varietal, and though the wines I tasted are from three estates that are owned by the same group, the impressions can be extended in a general way to the Montalcino and Montepulciano Appellations. Chianti Classico, because of its size, is inherently more variable -- greater variety of terroirs, exposures, soil types and so on, but if one keeps this caveat in mind I think the generalization holds here too.